The stock market hates uncertainty, and there is plenty of uncertainty with respect to the tensions over the latest round of North Korean missile tests. This post, originally published 13 September 2013, focused on the violence in the Middle East, specifically Syria, and the potential that the United States could enter the conflict and what that might mean for the markets. Given the recent actions by North Korea, we are responding to requests from Enterprising Investor readers to provide an update. So, is now the time to beat a hasty retreat from stocks? The answer to that is, it depends. Let’s look at how the markets responded to the previous round of North Korean missiles test earlier this month. Prashant S. Rao had a different spin on the matter. He looked to the global markets and saw the accelerating sell-off as the result of the escalating tensions between the two countries. “Asian stock markets closed lower and European indexes opened sharply down, on fears that the verbal back-and-forth between Washington and Pyongyang had raised the risk of actual conflict,” he wrote. Lewis Krauskopf and Rodrigo Campos also claimed that the fall in global stocks earlier this month was the result of the rising geopolitical tensions. With repeated tweets by President Donald Trump vowing to “rain fire and fury like the world has never seen” down on North Korea if it threatened the United States, and that “military solutions are now fully in place, locked and loaded, should North Korea act unwisely,” is it any wonder markets are jittery? So how have historical capital markets performed during times of war? We looked at returns and volatility leading up to and during World War II, the Korean War, the Vietnam War, and the Gulf War. We opted to exclude the Iraq War from this group, as the Iraq War included a major economic boom, and subsequent bust, that had very little do with the nation’s involvement in a war. As the table below shows, war does not necessarily imply lackluster returns for domestic stocks. Quite the contrary, stocks have outperformed their long-term averages during wars. On the other hand, bonds, usually a safe harbor during tumultuous times, have performed below their historic averages during periods of war. The full period of study, 1926 through July 2013 is shaded in blue and provides a “control” group for comparison. Periods of war are highlighted in red. All of the individual wars we considered are listed below. Interestingly, both large-cap and small-cap stocks outperformed with less volatility during war times. The Vietnam War was the one exception, where stock returns were worse than the full period average. Even then, though, the returns were positive and above those of bonds and cash. It is interesting to note that stock market volatility was lower during periods of war. Intuitively, one would expect the uncertainty of the geopolitical environment to spill over into the stock market. However, that has not been the case, except during the Gulf War when volatility was roughly in line with the historical average. Capital market returns during the Gulf War were different from other wars. This war was very short, spanning less than a full year. This period also coincided with an oil price spike that helped push the economy into a brief recession. The idea of recession during war time was fairly new, and reflected the changing US economy. During previous wars, the economy was more exposed to capital goods and natural resources, which experienced greater demand to feed the war. However, by the 1990s, the economy had shifted away from heavy industry and toward the current “knowledge-based” economy. Thus, military demand had less of an impact, for better or worse, on economic growth. 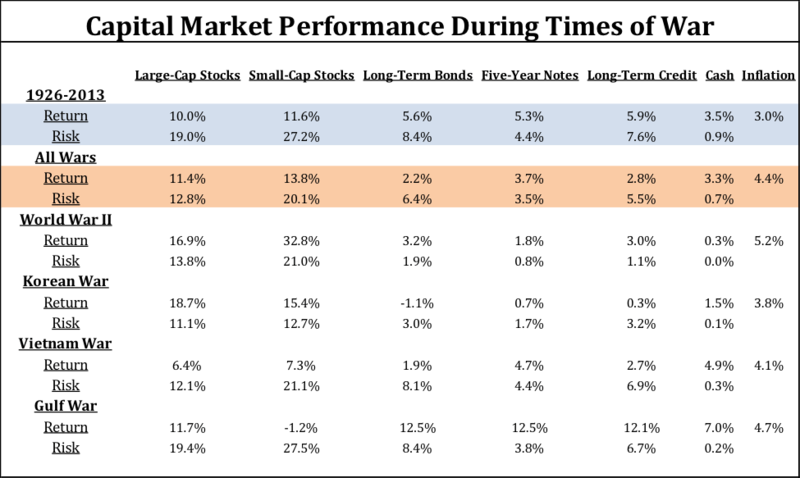 Bonds generally underperformed their historical average during periods of war. This is likely, at least in part, because inflation has been higher during war times. Bond returns have historically been negatively correlated with inflation. Another explanation is that governments borrow more during wars, thus driving bond yields up and bond prices down. With the higher inflation and increased government borrowing associated with war time, investors seeking safety may want to think twice before shifting assets from stocks to bonds. There are many economic and fundamental factors that impact security prices. Occasionally, a single event is powerful enough to dominate these other factors to singly influence capital market returns. However, historically speaking, this has not been the case with wars. Economic growth, earnings, valuation, interest rates, inflation, and a host of other factors will ultimately decide the future direction of the stock and bond markets. While a knee-jerk decline is possible if war breaks out between the United States and North Korea, history suggests that any market decline should be short-lived. I found the article very informative and masterly written. The outcome of this research, based on historical fluctuations, is eye-catching. I hope to read more articles of this kind in close future. I would share it on LinkedIn. It would be helpful to expand the analysis to recent wars like Iraq War (2003-2011) and Afghanistan War (2001-2014) which were long drawn conflicts, a scenario that could be repeated if US gets entangled in Syrian situation.